THE EARLY and middle nineties saw the last of the great trail herds of Texas following the long road to northern pastures and northern markets. Texas fever, increasing number of nesters along the trails, barbed wire fences, and the expansion of railroads had brought to an end one of the most picturesque periods of history of the old Southwest, and were ushering in a period of development which will not reach its full height for many years to come. While the old order was passing there existed in the Panhandle of Texas, one of the largest ranches in the world; one whose organization was to exert an immense influence upon the development of Northwest Texas. This was the XIT Ranch, composed of a vast body of land. 3,000,000 acres of which the State of Texas traded for its huge granite capitol building, and 500,000 acres which the capitol Syndicate purchased. Many people have been under the impression that the Capitol Syndicate was an English concern, but it was not. It was chartered in England, however, because the Farwelis of Chicago, who owned it, went to England and there obtained the loan which enabled them to finish the capitol building and to develop the vast territory which composed their holdings in the Panhandle. The ranch, like hundreds of others, was commonly known by the name of the brand it used; it was said that the brand, XIT stood for Ten (Counties) in Texas. It is not strange that the brand became so well known, for cattle with XIT burned on them covered a ranch 575 miles around; a ranch which had as its northwest corner the northwest corner of the Stale, and extended south 185 miles to a point in Hockley County; the east line of the ranch was 175 miles long, and the north line 80 miles long. When the Farwells came into possession of this land in 1883 they intended to colonize it immediately, but upon investigation they decided that the land was too new and untried for this, and determined to fence it and develop it as a great ranch, which they proceeded to do in the late eighties. Fencing alone was a stupendous task; 210 carloads of wire, 101,200 posts and a carload of staples were freighted from Fort Dodge, Kansas, a distance varying from 250 to 270 miles. This first fence, even in the old days of low prices, cost $171,000. All this had been completed long before 1899. During the years that this territory, big as the State of Delaware, was being stocked, and the country was being tried, a complicated organization was worked out in order to manage the ranch with a minimum of waste. By 1899 the XIT had facilities for caring for 150,000 cattle, There were eight divisions of the ranch; these were named from north to south, Buffalo Springs, Middle Water, Minneosa, Rita Blanca, Escarbada, Bovina, Spring Lake. and Yellow Houses of Casa Amarilla. These names are more or less descriptive and they give hints of the Mexican sheep men who used the land before it passed into the hands of the Farwells. There was never a feud between sheep and cattle forces here, because the Mexicans moved west without offering opposition to the new owner. Each division had Its own headquarters, foreman and crew The crew of each division was composed of the cow outfit, having ten to twelve men and one or more windmill outfits, each having two men. 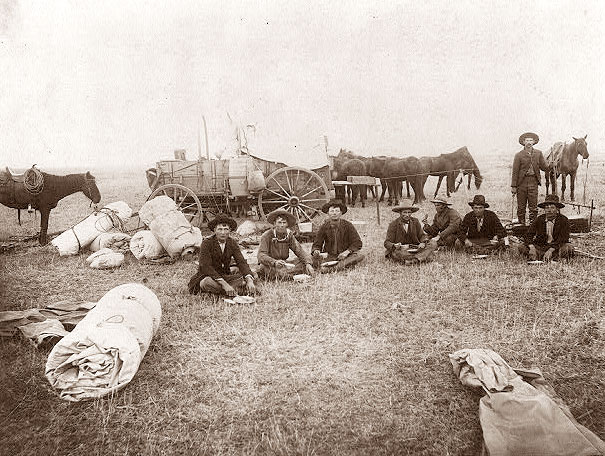 Each cow outfit was provided with a chuck wagon, on the back of which was carried the chuck box containing knives, forks, spoons, tin plates, sugar, spice, coffee, soda, baking powder and other articles for immediate use. Under the bed of the wagon was a huge box which contained the heavier cooking utensils. In the wagon was carried flour, bacon, beef, pickles, beans, dried fruit, molasses (lick) and a case or two of canned goods. On top of these were carried the "hot rolls" or beds of the cowboys. These beds contained several pairs of double blankets and soogans (heavy comforts often made from patches of pants, coats and overcoats all rolled in a tarp, which was made of heaviest duck and is 15 to 20 feet long. These tarpaulins would not be penetrated by the hardest rain. The work of the cowboys was hardest in spring and fall. In the spring, the cattle were rounded up, the calves branded and the steer yearlings rounded into a separate punch to be taken north for maturing. In the fall the calves were gathered and weaned; as the annual calf crop of the XIT was about 31,500, and sometimes 1,000 calves were put into one corral, the lowing that followed their separation from their mothers can be imagined. Hundreds of stories could be told about the work of the cowboys who cared for these vast herds—stories of stampedes, dearth of water, wonderful cutting horses, expert and poor cooks, tenderfeet, killing of wild animals, terrific blizzards, and dozens of other things that made up life in an open, untamed country. The windmill outfits of each division consisted of two men, supplied with mule team and wagon, tools enough to equip a small blacksmith shop, and supplies to last many days; these outfits kept the windmills in repair and sometimes kept up the fences. The XIT maintained a general headquarters at Channing, in Hartley County. Here the general manager resided, and from this point all the business of carrying on the ranch was transacted. The amount of this business may be judged from the fact that besides 150,000 cattle, the buildings on each division, the fence that enclosed the ranch, there were 130 men, 1,025 saddle horses, 850 stock horses, 100 mules, 45 wagons, 1,000 gates, 335 windmills, and 500 dams or earthen tanks and 1,500 miles of pasture fence to be kept in order. During the first years of its existence the XIT freighted all its supplies from Dodge City, later from Amarillo; then Channing on the Fort Worth and Denver railroad, and Bovina, on the Santa Fe became the supply stations. The company paid its men about $50-$100 each year, and employed about 130 men all the time. The headquarters maintained a regular system of distributing mail to its employees. It endeavored to see that injured or sick men were cared for in a territory in which not one physician resided. And during the years that the ranch was kept intact, its owners were learning about the country and gathering the information which would make it possible to successfully settle it. Rain gauges and thermometers were kept at every division headquarters and records carefully kept. Logs were kept of the wells, experiments were made with different crops to determine which were best fitted for the climatic conditions that prevailed. In 1900 the great ranch was placed upon the market. According to the printed advertising matter of the company, one million five hundred thousand acres of it was sold by January, 1903. During these early days, the owners advised prospective buyers not to purchase less than 2,000 acres, as at that time it was not believed that a smaller acreage could be profitably operated. Among the large early sales of the land, was that to the late Major Littlefield of Austin, who purchased 275,000 acres at $2 an acre. The 1,500,000 acres sold at that time brought $1.50 and $2 an acre and the money derived was used to develop the remainder of the ranch. The owners sold their cattle holdings in 1909 and 1910, and since that time the land remaining as a part of the old XIT Ranch has been leased to livestock men or has been sold. It is estimated that 95 per cent of the buyers of this land became actual settlers. Where in 1809 there were thousands of cattle and a few hundred persons, now there are hundreds of cattle and thousands of people. A territory which a generous census of 1900 gave 778 persons now has 46,000, and the story has just begun. Dozens of rapidly-growing small towns and a few budding cities are to be found. Dalhart, Channing, Vega, Genrio, Summerfield, Friona, Bovina, Farwell, Amherst, Littlefield, Olton, and Muleshoe are growing by leaps and bounds. Where line camps may have stood now are school houses, structures of brick and mortar, equipped with electric lights and all modern appliances, and serving hundreds of children. This land is now known, not by the single brand which its cattle made famous in the great markets, but by its varied products; wheat fields, some of them two to four thousand acres in area; maize, Kaffir, corn and feterita, which fed to hogs is making the farmer content and prosperous; potatoes, fruit and all the products of the truck garden are now to be commonly seen on the farms. The last five years have seen the north boundary of the cotton region pushed constantly north. The old ranch area is proving itself a region particularly adapted to the raising of chickens and turkeys. And now, in the opening months of 1927, there is not one of the Ten Counties in Texas, but with dreams of becoming the oil center of the Panhandle field. And no one knows yet which bit of the old land will be able to claim this title. While this material development has been going so rapidly forward, spiritual and intellectual advances have been made. Where there was no church except the out of doors with its roof the sky. there are now hundreds. Where colleges were yet undreamed of, there are now three. Where there were camps for men there are now homes with life complete and happy. The old West has passed; the new order is as untried as the land of Northwest Texas fifty years ago. And no man yet knows which period the life of the world a thousand years hence will find to have been more significant.